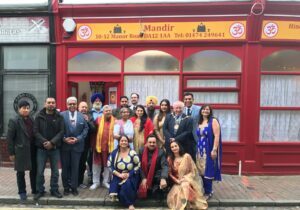 A ceremony was held 11th May to celebrate the opening of a new Hindu Mandir, or Temple, in Manor Road, Gravesend, a significant milestone for the Hindu community as it is their first place of worship in North Kent. The Lord-Lieutenant of Kent was represented by Deputy Lieutenant Dr Bhargawa Vasudaven DL and guests included the Mayor of Gravesham Cllr Harold Craske, Adam Holloway MP, former Cabinet Member Priti Patel MP, Cllr Gurjit Bains, a representative from the Indian High Commission, radio and TV presenter Ravi Sharma and Gurvinder Sandher from Kent Equality Cohesion Council. They were joined by other community partners including Kent Police and the North Kent Interfaith Forum and more than 100 people from the local congregation. Previously, a school hall was being used for worship and special occasions in the town. The new temple was opened with the help of the local community. Thank you for inviting me. I am here today on behalf of our Lord Lieutenant Viscount De L’ Isle who sends his best wishes to you all. A Hindu temple is a symbolic house, seat and body of god. It is a structure designed to bring human beings and gods together, using symbolism to express the ideas and beliefs of Hinduism. The symbolism and structure of a Hindu temple are rooted in Vedic traditions, deploying circles and squares. A temple incorporates all elements of Hindu cosmos—presenting the good, the evil and the human, as well as the elements of Hindu sense of cyclic time and the essence of life—symbolically presenting dharma, kama, artha, moksa, and karma. The underlying principle in a Hindu temple is built around the belief that all things are one, everything is connected. A house-themed temple is a simple shelter which serves as a deity’s home – an Oasis amongst the sea of daily Chaotic life around us – may this Mandir be a place of tranquility, peace, reflection and prayer.